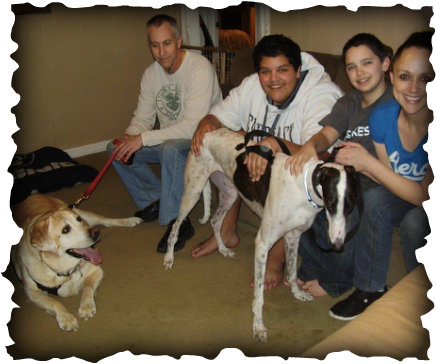 Brittany, Kevin, Jimmy and Xavier of Kettering were looking for a new friend for their Lab Zeus who not only went blind from diabetes but also lost his Lab buddy recently, and a greyhound seemed like a good fit. PJ Admirable, known as Prissy, is a bit more active than many greyhounds but way mellower than most Labs. She learned quickly to give Zeus his space and he is learning to share his territory with a new friend. The family is crazy about this sweet girl who will be well cared for and loved.